I grew up in a home where motorcycle magazines often outnumbered the amount of books on my parents coffee table. My father was often passing on words-of-wisdom from the likes of Clement Salvadori and Peter Egan. I would simply nod and smile, though it would be years before I had any idea what he was talking about. On Saturday mornings we would hop into his old Dodge pickup and ride across town to check out all the newest releases at the local bike shops. Despite my father spending my entire childhood dragging me around to every motorcycle showroom in a 75 mile radius of our home, I was forbidden from having a motorcycle of my own. The magazines littering the living room became my escape. I would immerse myself in a world of two wheeled adventures and stare at the pictures of well worn rust buckets and shiny new machines with the same lustful eye. I remember learning about the British Motorcycle Industry through Peter Egan’s torrid love affair with vintage Triumph Bonnevilles and Norton Commandos. He would tell stories of lust and heartache as he romanticized the countless hours spent in his garage, covered in starting fluid and 50 weight oil, trying to nurse these beauties back to life. It was with the same affection that he would speak about his well worn Belstaff wax jacket from England. In the days prior to Gore-Tex, clothing manufactures would waterproof their garments by applying a thin wax to the outside of the material. As the wax wore off the jackets would lose their ability to wick away water and would require rewaxing. As advancements in clothing design and waterproofing technology increased, the use of wax coating declined until it became almost obsolete outside of vintage enthusiasts. Perhaps Roland Sands grew up reading the same articles as a youth or perhaps he just wants to foster a more nostalgic image within the motorcycle community. For whatever the reason, Roland Sands Designs will be introducing the Clarion Jacket and Chandler Jacket to their 2014 lineup. 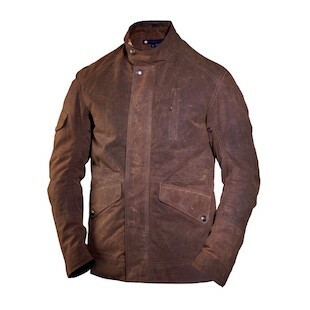 For those riders looking for that original Belstaff style but do not want to shell out $800 for a 40 year old jacket that has been sitting in someones garage for the past decade, the RSD Clarion Jacket is the perfect alternative. The Roland Sands Clarion Jacket looks like it belongs in the showroom window of a London boutique in the 60’s. It features a rugged, Martexin wax coated canvas. The waxing process creates a water repellent, yet breathable, skin like layer that permeates the fabric during the bonding process. The sleeves are pre-curved with a relaxed fit that sits a bit longer at the waist. An upright collar can be worn folded over for a classic look. The main closure in the front of the jacket is provided by both a zipper as well as a snap over flap. The front of the jacket is adorned with two simple flap pockets and one vertical zippered pocket over the left breast. The Clarion gives a nod to modern impact protection with the inclusion of armor pockets at the shoulders, elbows, and back. The available armor is sleek and lightweight while maintaining a CE rating. The Clarion would look at home hanging out in a crowd of vintage Cafe Racers with a few rusty Bobber projects thrown in for good measure. While the Clarion utilizes a vintage waxing process, the Chandler Jacket uses a modern Polyurethane coating to keep you dry. In my opinion the Roland Sands Chandler is more of a shirt than a jacket. It offers riders lightweight wind and rain protection during around town jaunts. While it will repel water and block the wind, it is important to note that there is no impact protection available should you take a tumble. 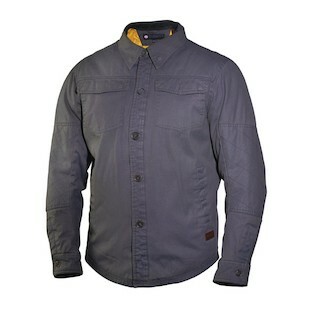 It features pre-curved sleeves and a main button closure as well as dual-breast pockets with snap closures. There will be a zipped pocket on the sleeve and the cuffs will secure with buttons. Both the Clarion and Chandler have a distinct vintage look and feel. The Chandler uses modern PU technology to achieve this while the Clarion relies heavily on the Belstaff playbook of vintage wax waterproofing design popularized in Britain so many years ago. Eventually it was a simple column about an old Belstaff jacket and a new Triumph Bonneville T-100 that pushed me over the edge into the world of British motorcycles. Within a month of reading about the new modern Bonnie I was standing on the showroom floor of Hermy’s Triumph and BMW in Port Clinton, PA handing over my hard earned cash in exchange for the keys of a brand new, Black and White, 2005 Triumph T-100 of my own. I am not sure exactly what my father was expecting to happen by instilling in me a love for motorcycles and then forbidding me to own one, but I can tell you about his reaction to what did happen. At 22 years old I left that dealership and drove straight home and set the keys down in front of him. Without saying a word he stood up, walked outside, and drove away. A slight panic set in as I was suddenly terrified he was returning it to the dealership. However, my fear was misplaced as within 15 minutes he rolled back up the driveway and shut off the engine. “Son”, he said, “This is the best purchase you have ever made.” Six months later I was driving him to pick up a new bike of his own.